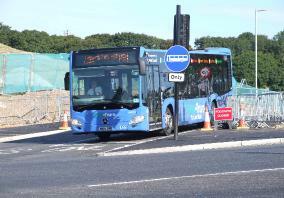 The roadworks at Tregolls Road junction with the Newquay road were completed on 4 August 2015 and the new traffic light system switched on. All the holdups that motorists have suffered for several months have now disappeared as the new layout and signalling seem to be working perfectly. Traffic is flowing freely to and from all directions. The long wait has been worth it! 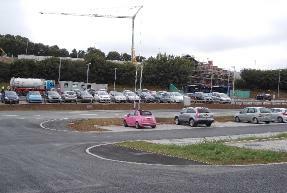 On 12 August, the park and ride site opened. Motorists approaching from Tresillian are able to turn right into the site at the traffic lights about 200 yards before the Tregolls Road junction. 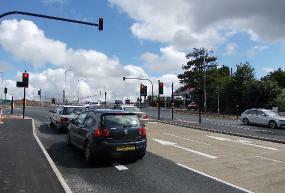 Motorists approaching from the Newquay road can turn left into the site before the junction. There are more than 1000 parking spaces available. The terminal building for the park-and-ride buses is not yet complete, but there are temporary ticketing facilities which are working fine. 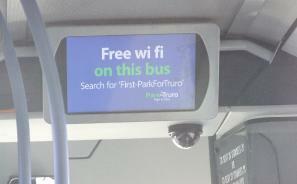 The new buses have free wifi on the vehicles. The buses take passengers into the city centre and on through the centre to the station, County Hall, Treliske, Truro College and the western park-and-ride terminus. The fare is £2 per person for a one day ticket, i.e. you can hop on and off a park-and-ride bus as many times as you like on one day using the same ticket. On Saturdays, the tickets are just £1 per person. Concessionary pass holders can purchase a ticket for £1 after 9.30 a.m. Monday to Friday. There are also cheaper fares for family groups. Passengers can purchase 5-day, 20-day, 60-day or annual passes that provide a cheaper daily rate. There is no charge for parking your car. The buses run from before 7 a.m. in the morning until after 7 p.m. in the evening, Monday to Saturday. Buses run every 10-15 minutes for most of the day. The site is open to collect your car up until 8.30 p.m. Then the site is closed overnight. The service does not operate on Sundays. Coming into Truro from the east: Quay Street (opposite Haven House), and Victoria Square. Getting on in Truro to return to park-and-ride: River Street (outside museum), and Quay Street (outside Haven House). The park-and-ride buses do not stop in Boscawen Street - you cannot alight or board outside BHS. For further details, see Park for Truro From there, you can download a full timetable and see details on prices of tickets including season tickets for regular commuters.